When the first page of a restaurant’s menu is littered with phrases like “if there is a single food that represents Argentina, it is beef” and “Argentine beef is highly prized for its flavor and tenderness” you quickly realize they’re trying (not so subtly) to tell you what to order. Tango is, as far as I know, the only Argentinian restaurant in the Boston area. They focus heavily on meat, and the menu is full of various grilled meat options. Of course, there are traditional Argentinian appetizers too, as well as salads, pastas, and desserts. We had the privilege of going with a friend who actually grew up in Argentina. It was great – he spoke Spanish with the owners, arranged to get a huge table for our party of 10 on a busy Saturday night, and ordered a bunch of traditional Argentinian dishes for us. We started with a variety of interesting appetizers. Our friend said this dish was very authentic. It’s a cold dish made of veal rolled around hard boiled eggs, marinated vegetables, and spices. It comes with Russian potato salad on the side. 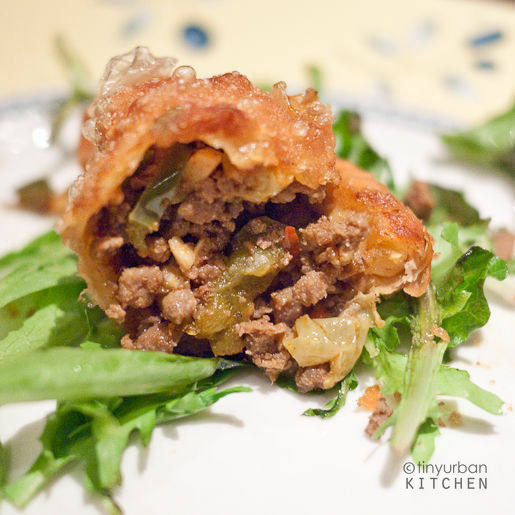 This was delicious – a fried pastry filled with flavorful ground beef. Here’s a closer look at the inside. Canned palm hearts drizzled with this traditional yet simple sauce consisting of mayonnaise, ketchup, and mustard. This sauce (originally a mixture of ketchup and mayonnaise) was supposedly invented by Argentinian Nobel prize winning biochemist Luis Federico Leloir in 1920. So the roots of McDonald’s special sauce was invented by an Argentinian??! I found this dish to be uninspiring, personally much preferring the lighter, less saucy palm heart salad at Muqueca. I’m not sure if this is an actual Argentinian dish, although it does focus on beef. This dish was solid, though perhaps there are better renditions of it at other places in Boston. Of course, meat is the focus of Argentinian restaurants, so virtually everyone ordered meat, with a majority of folks ordering beef. In general, the flavors of the meat dishes are great. You won’t go wrong ordering beef. One thing, though – they do tend to overcook their beef. A “medium rare” becomes more like a cross between medium and medium well, while a “medium” becomes close to well done. On the other hand, the lamb chops were reasonably medium rare. The vegetables are crunchy and fresh, and the mashed sweet potatoes are fine, though nothing to write home about. What is the most interesting thing to order . . . This is not for the faint of heart. We had two guys share this, and they totally could not finish. I saw another family of three order this, which might be a little bit more do-able. The parrillada para dos, which translates to “grill for two,” is a feast of various slow-grilled meats. It’s set up in a way to allow you to enjoy different parts of various animals. In this particular version, there are short ribs (a quintessential ingredient in any parrillada), sausage, blood sausage, kidneys, chicken, and sweetbreads. It was definitely an interesting experience to try so many different things. My favorite was the sausage, although the sweetbread wasn’t bad. It comes on a portable charcoal grill. You can eat your meat with chimichurri sauce (olive oil, parsley, and hot pepper) or just enjoy it plain. The side of fried potatoes was pretty good – kind of like thick cut potato chips. I’ve read that there are much better restaurants in Argentina. But we’re not in Argentina, and Tango is the only Argentinian restaurant here. I think it’s a great place to visit. It has a nice, lively vibe, authentic dishes, and delicious food. The service can be slow. In fact, it took us over an hour to get our main entrees, which is a bit ridiculous. I hope that it was just an off night, and that it’s not always so slow. Definitely go with a large crowd so you can try different things. I would recommend trying the Parrillada Para Dos, at least one of the steaks, and a few appetizers, such as the empanadas. End on a cappuccino note . .. Note: Arlington, right across the border from Cambridge, is about a 20-25 minute drive from Boston without traffic. It’s still not to late to enter to win a Sodastream Soda Maker! Drawing will occur on Thursday, April 29, 2010 at midnight. « Sparkling Blood Orange + GIVEAWAY! What was the bottom right salad next to the heart of palm? Pru – oops! I just realized I forgot to write the heading for that one! Thanks for the catch – I will update the post. oops! I just realized I forgot to write the heading for that one! Thanks for the catch – I will update the post. I’ve driven by here several times but I think it just got added to the list! I am so sad I missed this meal! It looks like a great place. Definitely something I am going to have to try. The pictures above made my mouth water. I hope I can venture down to Cambridge soon to partake in this great menu. It will take me 4 days to consume the meat plate.